Explosives and guns in D&D 5e are where many groups draw a line in the sand. Traditionally speaking, it sort of makes sense since most groups opt for a more medieval, high fantasy, or Tolkien-esque setting. There weren’t any guns in any of these settings so it’s a bit jarring to include them. However, in a game where gods screw around in the material plane and magic is found everywhere guns seem like a weird point to say “no that’s too far, you’re breaking my immersion”. I added them to my long-term campaign and while my players don’t use them I find that they’re a fun addition to the game. They’re deadlier than your average bow or crossbow, but they have some unique mechanics and drawbacks. I find that this makes for a much more interesting game and gives martial characters some much-needed depth to their ranged weapon arsenal. 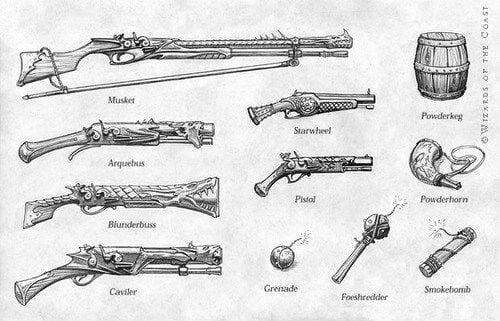 Pages 267-268 of the Dungeon Master’s Guide have the unique rules for guns and firearms as well as a few tables full of firearms and explosives. These weapons are broken into 3 different categories: Renaissance, Modern, and Futuristic. I’m going to focus on the Renaissance Weapons like muskets, pistols, and kegs full of gunpowder. These feel like they fit more naturally in D&D 5e’s combat compared to automatic weapons. My gripe with the Modern and Futuristic weapons is that they’re just ridiculously more powerful than Renaissance Firearms. Using them is going to change the game from a more traditional D&D game to a constant gunfight. There are systems literally made to deal with modern-day guns and weaponry that I’d rather try instead of reskinning D&D 5e. Mechanically speaking the Renaissance Firearms are essentially modified crossbows. They have the loading property, more damage, but a shorter range compared to their crossbow counterparts. They’re also a lot more expensive and are potentially harder to find. The explosives are a bit more interesting. They basically work like miniature Fireballs that are much more expensive and have a smaller range. Honestly, I’d be fine with adding the Modern Explosives outside of the Grenade Launcher to my campaign as they don’t seem very overpowered. The scope costs extra. Art by Yama Orce. In my home game, I’ve shifted it from a traditional, high fantasy sort of campaign to more of a Napoleonic-era game. There are still swords and melee weapons galore. Some races even prefer to use the “ancient” weapons instead of guns and explosives. It was mostly a matter of reflavoring to get guns to work in a D&D 5e game. The average soldier or adventurer tends to favor leather or cloth armors as they provide more comfort and movement. The heavy metal armors of old don’t hold up well against guns so it makes sense to favor armor that allows you to duck for cover quicker. Weapon technology has changed, so armor technology will have to catch up to it. Metal armors are modeled more after a Cuirassier or a Dragoon‘s equipment. A full-plate armor set is now a breastplate with some reinforced leather armor to protect the non-vital parts of your body. When you compare the firearms in the DMG with crossbows and bows you’ll immediately notice that they deal a fair amount of extra damage. That being said, it comes at a cost. The Renaissance guns are by no means the efficient weapons that we have today. These are clunky, noisy, and of course, expensive to maintain. All of these factors should come into play to help offset the additional damage you’d gain from using a gun instead of a more traditional weapon. Both the pistol and musket deal a bit more average damage than your typical crossbow. Thematically this makes sense as a bullet is going to deal a lot more damage to your body than a crossbow bolt. The pistol is one-handed and deals 1d10 piercing damage or an average of 5.5 per hit. However, it isn’t a light weapon so it cannot be dual-wielded without the Dual Weilder feat. This is how it’s allowed to deal an average of 2 piercing damage per shot higher than its hand crossbow counterpart. The musket is the two-handed answer to Renaissance Firearms. It deals a whopping 1d12 piercing damage which is an average of 6.5 per hit. That being said it’s only an average of 1 extra piercing damage per hit compared to the heavy crossbow. Think of the light crossbow as the middle-ground. It deals 1 less average damage than the pistol, but it requires 2 hands to operate. Like I’ve said before. D&D guns will deal more damage than the other ranged options. It makes both thematic and mechanical sense. However, these old-time firearms are nowhere near as efficient as bows or even crossbows at long distances. The pistol has a range of 30/90 feet which is respectable when compared to the hand crossbow’s 30/120 feet. However, a light crossbow shoots 80/320 feet making it a much safer option to use. Both the pistol and hand crossbow have their perks, but for maximum survivability, you may want to ditch the guns and hide up in a tree. The musket doesn’t fare much better than the pistol, unfortunately. It clocks in at a measly range of 40/120 feet. Compared to the heavy crossbow’s 100/400 feet its additional 1 average damage per hit may not be worth losing the safety of a 100 ft. range. None of these weapons compare to bows though which do deal less damage than their crossbow counterparts. However, a shortbow has a range of 80/320 feet and the longbow can shoot at a range of 150/600 feet. They also do not have to deal with the loading property. 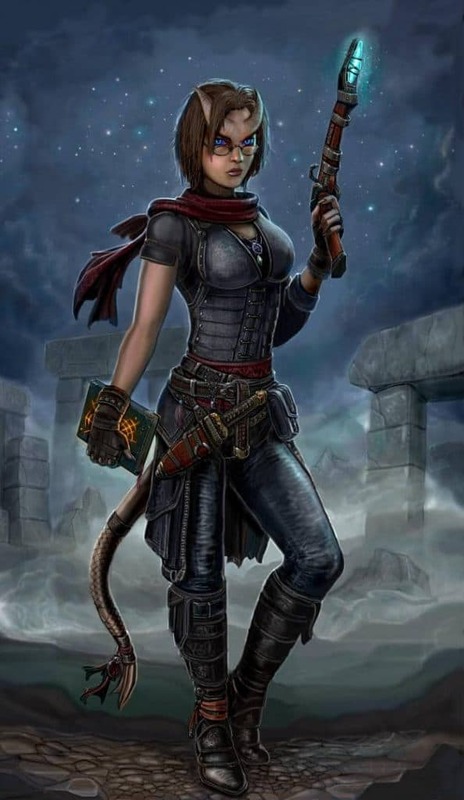 If guns are a thing in your D&D game then magical guns should be a thing! Art by SirTiefling. Have you ever heard an old musket fire before? It’s loud as hell. Sure your character might be able to sneak behind an unsuspecting guard, but even a Pass Without Trace spell can’t silence the roar of your weapon. This is a downside to guns and explosives that not a lot of people take into account because it’s not listed as a property of the weapons. However, I can assure you that it’s something your DM will be considering every time you make a shot. Will your gunfire draw the attention of more guards or henchmen? Sure you’ll deal more damage, but it may be worth it to stow your piece and pull out your trusty bow that’ll make barely a peep. On the other hand, combat, in general, is pretty loud. The roar of gunfire shouldn’t be a constant setback for your character, but it may be something to be aware of while stealthing. Ammunition is expensive for firearms. In D&D you generally can retrieve half of the ammunition you use after a battle has taken place. It’s a good way to make up for the fact that ranged martial characters typically spend more money than their melee counterparts. This all goes out the window for guns though. Ammunition is expended as soon as you roll to attack with a firearm and it cannot be retrieved. Not to mention the fact that 10 bullets cost 3gp while 20 arrows cost 1gp. The same goes for bombs and powder kegs. As soon as they are lit and exploded there is no way to retrieve the ammunition. You’ll need to use your explosives wisely as they are extremely expensive. I’ve chosen to include guns in Crossbow Expert‘s benefit where the user can ignore the loading property of crossbows or guns that they are proficient in. You could certainly make the case that guns are more powerful ergo they shouldn’t get this benefit, but I don’t find that to be very fun. I also would argue that they have plenty of issues that make their extra damage not always a worthwhile advantage. They’re expensive, noisy, and have a shorter range when compared to crossbows which already have a shorter range than bows. Allowing a character to use one of their ASIs to get rid of the loading property (among other things) is fair. It’s a tax for characters with extra attack that want to use guns just as it is for characters with extra attack that want to use crossbows efficiently. Firearms and explosives come in all different shapes and sizes. Art by Wizards of the Coast. 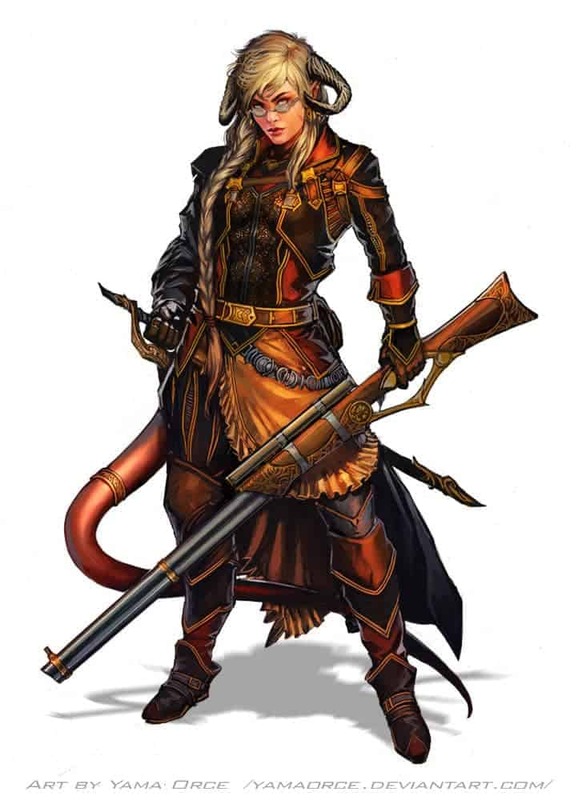 I love the addition of firearms in my D&D games. I feel that it adds yet another layer into character creation and gives ranged weaponry a bit more depth. Sure, guns deal the most damage out of any ranged weapon, but is it worth the cost, lack of stealth ability, and shorter range? Guns are a high-risk, high-reward weapon to use in D&D 5e. Like the crossbow, they’ll require at least 1 feat to be useful for fighters and other classes with extra attack. It’s an investment will pay off, but it’s a very different fighting style compared to the other, longer-ranged options. Explosives serve as a way for martial characters to deal AoE damage. It’s never going to be as deadly as a spellcaster’s AoE attacks, but giving your players an option, albeit an expensive one, is never a bad idea. The only gripe I have with the DMG weaponry is that there isn’t a lot to choose from. On the other hand, this is the perfect time to learn how to homebrew your own weapons! Variety in weapon choices will always be welcomed by your martial characters.